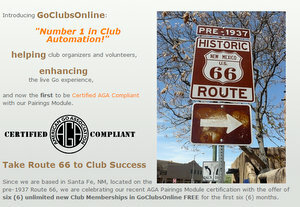 GoClubsOnline (GCOL) is offering six unlimited club memberships to celebrate GCOL’s status as the first pairings software to be certified as AGA compliant. To qualify, go clubs must be holding — or plan to hold — tournaments in the near future, says GCOL’s Robert Cordingley. The memberships will be free for the first six months. Visit GCOL’s Overview web page to learn more about their comprehensive web-based system, including membership management, on-line tournament registration and check-in capabilities. Contact Cordingley at rjcord1@gmail.com to apply or for more information. “When applying, please include some details about the club and tournament plan,” adds Cordingley. The AGA is seeking volunteers to help develop and implement a regular process for pairings certification to expand beyond this first certification. Any interested players or programmers should contact Tournament Coordinator Karoline Burrall Li at karoline.burrall@usgo.org.